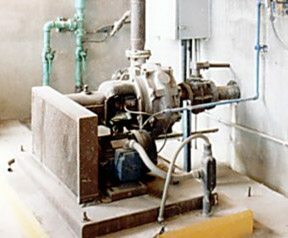 The most common use of frequency converters is to drive sludge pumps, elevators, conveyers, aeration, chemical dosing, clarifiers, digesters, presses and centrifugal dewatering. In the beginning water is being pumped into the plant from the collection basin. The frequency converter is using water level as input to control the speed (flow) of the pump. Removal of bigger solid particles out of wastewater is usually the first basic process in wastewater treatment, and we use it to prevent frequent flooding and overflows and jamming of cleaning device, to protect valves, pumps and pipes and to keep the rest of the process going normally. Bigger pieces of wood, plastic, metal, rubber, textile and other waste materials out of wastewater is being removed by using bar screens. Coarse sieves have openings equal to or greater than 6 mm and generally protective role, while using a fine sieve, with openings smaller than 6 mm, and can achieve significant removal of suspended solids from the wastewater. The grid is usually made up of parallel rods, while the fine screen usually used wire cloth or perforated metal plate. In the further process of wastewater treatment applications are similar installations for the treatment of drinking water. First the floating organic and inorganic impurities are removed. 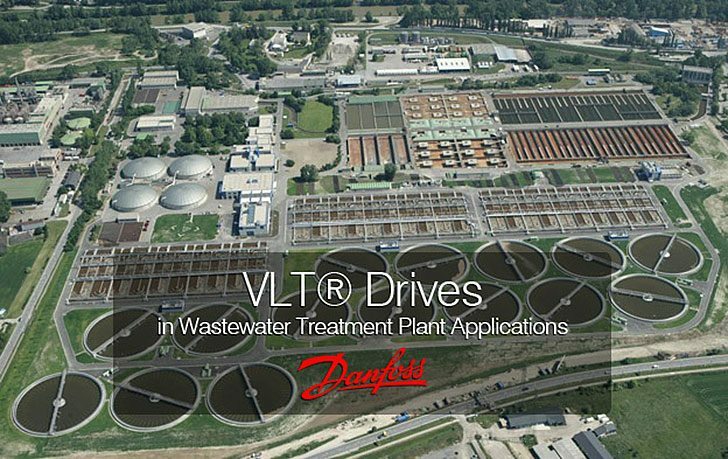 We use drives in clarifiers with scrapers, chemical dosing in the process of coagulation and flocculation and the sludge removal pumps and various pumps to transfer treated water from one part of the plant to another. Deposition belongs to the sedimentation process group – the process of separating the solid and liquid phases under the influence of gravity. Deposition takes place in clarifiers. Colloids are very stable suspension of fine particles in water, and their size in range of 0,1 – 0,001 μm. Because such a small size of individual particles, colloidal suspensions are practically stable and appear as a “cloud” in the water. Colloidal suspended material cannot be removed using only filtration techniques. The separation is based on the processes of coagulation and flocculation (clarification). Mixer motors in process of coagulation and flocculation are driven with frequency converters, where the mixer speed in process of coagulation is determined by the amount of chemicals that is added in coagulation process. In flocculation process mixer speed is determined by the amount of incoming wastewater (flow) because if the mixing speed is to low flocculation will not be possible, however if the mixing speed is too fast, floccules that are already created will dissolve. Outgoing sludge pump is controlled by frequency converter that has clarifier water level as input. The advantage of using frequency converters is in reducing the sludge level, preventing „Rathole” effect in sludge pump, and preventing overload and underload of the pump. Underwater blower aeration is one of the most efficient ways to get proper aeration according water characteristics. Blower speed is being controlled by frequency converter. The input signal are flow (or pressure), the amount of oxygen and PH value of the water. Blower speed reduction leads to significant energy savings since it has variable torque, and it is one of the biggest energy consumers in wastewater plant. Filtration can be performed in open or closed, quick or gravity sand filters. Beside standard supply water applications and chemical dosing, very important application is filter backwash pump. When the backwash cycle is initiated, the feed pump receives a 4-20 mA signal from differential level transmitters monitoring the influent and effluent sides, and determines the amount of backwash water required for cleaning. This way we minimize filter media loss by controlling the discharge velocities of the pump. The backwash water from the collection sump is transferred back to the head of the plant. Drives on the transfer pump enable efficient transferring of the backwash water by operating at variable speeds to keep low water levels. Digester is the most important part of sludge treatment. There are two types of digesters: anaerobic and aerobic digester. Anaerobic digester is closed concrete chamber, where condition is controlled, without air, organic material is processed into methane and carbon dioxide using intermittent gas mixing system. As a result you can get natural fertilizer and biogas as fuel. The most common use of frequency converters to control the pressure of supply sludge pumps, control of circulation pumps that provide proper positioning of hot water, which is part of the technological process. In aerobic digester sludge shall be air supplied until it comes to the decomposition. Frequency converters control aeration blowers, oxigene sensors give them input signal so the air supply is regulated. Centrifugal dewatering motors are also controlled by frequency converters. In this case we have 2-3 preset speed so the centrifuge is optimized due to sludge supply. Centrifugal dewatering motors can go up to 400kW and all posible speed ajustments can lead to significant energy savings. Dewatering can be done by the press, which consists of two elastic straps that are placed parallel to each other, between them there is sludge drying by pressure and shear force. Frequency converters control the press motors according to the ammount of the sludge and its density. This way we can optimize dewatering process by speed ajustments. Nice explanation, step by step. Thanks Marko!